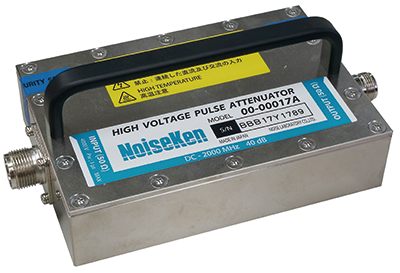 Attenuator for Waveform Observation Model 00-00017A - NOISE LABORATORY CO.,LTD. Coaxial 50 ohm 40dB (=1/100) attenuator. 4000V output of the INS is attenuated to 40V. Unlike the high voltage probe, the both input and output of the attenuator is of coaxial type, which eliminates probe test leads and thus allows a scope to measure the ideal waveform without overshoot on the rise time part of the pulse. Attenuates high voltage pulse of up to 4000V to 100:1. Wide band attenuation of DC to 2GHz.